It’s black history month, making this the perfect time to talk about the epic historical attractions in Chatham-Kent, Ontario. Chatham was a terminus of the Underground Railroad and became known as “A Coloured Man’s Paris” and “Black Mecca.” African-Americans flocked here not only to escape to freedom, but also for the tremendous educational opportunities available. Blacks could receive a high-quality, classical education and many who studied there went on to prominent careers in medicine, law, politics, and other esteemed fields in both Canada and the United States. This also fostered a thriving community that played a role in the campaign to abolish slavery. Chatham-Kent is only a few hours’ drive from both Toronto and Detroit/Windsor, putting it within easy reach for hundreds of thousands of travellers. The Chatham-Kent Black Historical Society has created a small museum to showcase the area’s black heritage and it is well worth a visit to help fit all of the pieces together and put everything into context. In addition to profiling prominent figures such as Mary Ann Shadd Cary, the museum has also dramatized the slave narratives of several ordinary people who came to Chatham, which I found especially fascinating. While you’re in Chatham town centre, be sure to stop by the BME Freedom Park which has lots of historical markers and is situated on the site where the first BME Church in Canada once stood. Originally known as The Dawn Settlement, this historic site was renamed Uncle Tom’s Cabin after former slave Rev. Josiah Henson who helped establish the settlement and whose memoirs served as inspiration for Harriet Beecher Stowe’s classic novel of the same name. The interpretive centre at Uncle Tom’s Cabin has exhibits about the history of the site and demonstrating different ways that slaves escaped to freedom and our tour started with an engaging talk by Curator Steven Cook. The rest of the exhibits are outdoors, ripe for exploring. An interesting factoid is that the site would have qualified for designation as a National Historic Site but for the fact that the cabin had been moved from its original location on a different part of the property. The two houses on the settlement contain period furnishings and household goods that show what life was like at that time. The Elgin Settlement was established in 1849 and gave black settlers the opportunity to buy 50-acre farms on an instalment plan. The community had all of the key infrastructure a pioneer needed, including a blacksmith shop, a mill, a cobbler’s workshop, churches, and the all-important school. Today most of the buildings are gone from the site, but the school and a typical cabin remain, and a new museum was constructed on the property to tell the story of life at that time. The schoolhouse was restored in 2002 and is a great place to visit and learn about the difference educational opportunities made to black settlers and former slaves. The school taught both children and adults, and of the first graduating class of six men, one became a politician, two became lawyers, and three went on to become doctors. Typical spelling lesson at the Elgin Settlement. For the record, “panegyrics” has an E in it. The one-room schoolhouse provided pupils a classical education, including lessons in logic, philosophy, and rhetoric. Curator Shannon Prince gave us a taste of what that was like by putting us through a spelling drill in which she dictated a passage for us to write down in chalk on our slates. I flunked because I spelled “panegyrics” wrong. Disclosure and acknowledgements: On this trip I was a guest of Ontario Tourism. Many thanks to Joy Sim and her colleagues in Chatham-Kent for being terrific hosts. What the Dickens is Markeroni? Markeroni.com is an online community devoted to landmark snarfing. Clear as mud, I bet. Anyhow, it’s been an integral part of many of my travels since 2004. My introduction to landmark snarfing — the act of visiting historic landmarks and photographing them, often with a toy mascot in tow — occurred serendipitously while I was attending the original BookCrossing convention in St. Louis. During an outing at the convention I was paired with Linda Gentile, founder of Markeroni. We hit it off immediately, with both of us possessing a wry sense of humour and having a nerdy bent. Since we’re both introverts, we were feeling the need to have some distance from the crowd for a bit and ended up exploring downtown St. Louis. At the time I didn’t know I was on a snarfari, or the role landmark snarfing would come to play in my life, just that I was having fun exploring history and discovering things that I wouldn’t have noticed otherwise. Linda explained the site to me as we walked and snapped pics. I will be the first to admit that having a toy “mascot” and running around all over Hell’s half-acre looking for historical markers and sites sounds like a load of nonsense. I am accustomed to being viewed as eccentric, but it struck even me as a bit daft at first. Like pairing Captain Crunch with hummus, it turns out to be one of those “Don’t knock it until you’ve tried it” deals. You can see where this is going. Before long I’d drunk the kool-aid and was officially a Markeroon. To compete in the annual Markeroni Challenge requires a mascot, which is how Snarfy entered my life. I didn’t put much thought or deliberation into acquiring Snarfy. I was eager to get started so I simply picked him up at the dollar store. Since then we’ve become loyal travelling companions, having all sorts of adventures together, from mountainpeaks to the Houses of Parliament and everything in between. Noticing things — Once I started looking for landmarks I found them everywhere. Right away I saw a historical plaque that I’d walked past at least a thousand times in my daily commute and never noticed before. I’m so grateful that Markeroni caused me to start really looking at things instead of giving everything a cursory glance. Landmark snarfing has made me more observant, and while I started out just trying to track down plaques, I see so much more of everything now. Trip catalyst — Because I don’t do things in half measures, I quickly exhausted the local supply of landmarks to snarf, and soon we were going farther afield to find fresh snarfs, and then even farther. Gradually the radius grew until we began to take multi-day snarfari trips and have visited oodles of places I wouldn’t have considered otherwise. I often need a reason or purpose to justify travelling, and Markeroni has provided that impetus many times. Different stuff — I confess that I can be a bit list-driven sometimes. I’m embarrassed to admit it since it belies a lack of substance, and a tick-the-box mentality, but sometimes it’s incredibly, irresistibly satisfying to check every single item off a list. On occasion I have visited sites and attractions that I had no interest in whatsoever other than wanting to snarf them, and many times I have made amazing discoveries in the process and broadened my horizons. Road trip! — Markeroni made me a road-trip-loving fool! Maybe it was traumatic memories of long family car trips from my childhood burbling to the surface, but road trips didn’t hold much appeal to me before joining Markeroni. Then came a few of the aforementioned overnight snarfaris and I caught the road trip bug. I came to love the planning of a road trip and the exploration involved, and yes, even getting lost! Now I’ll jump at any excuse for a road trip, whether it involves snarfing or not. 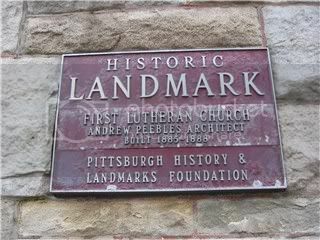 Context — I’ve always had a fascination with history, but before I started landmark snarfing history wasn’t really a part of my life. Landmark snarfing has dramatically deepened my knowledge of and interest in history. Historical knowledge brings context to my travels, adds meaning to the places that I visit, and helps me to interpret their significance. Conversation starter — I’m an introvert and can be extremely shy in person, especially around new people. There’s nothing like having a teddy bear peeking out of your handbag, or curious onlookers witnessing you lining up your mascot for the perfect shot to get the conversation started. I may not have the gumption to strike up a conversation, but if someone asks “What are you doing?” or “What’s with the bear?” I’m happy to chat with them, and I have met many interesting people this way. Camera at the ready — Nowadays it’s normal to always have a camera at hand, but when I joined Markeroni 8 years ago that wasn’t so, and I wasn’t in the habit of carrying a camera wherever I went. However I started to carry one all the time because you never know when you’re going to encounter an interesting bit of history. Inevitably I encountered more than just history, and I have become a better photographer and blogger as a result of having the camera in the moments when it counted. Community – Like many of the other online communities I belong to, I know that no matter where I am in the world, I can get in touch with a fellow member of the site, and there’s an extremely high probability that we’re going to get along like gangbusters. It’s always good to have a community to draw upon when you travel and I have been fortunate to spend time with several Markeroons in my travels, and they have always enriched my experiences enormously and been fantastic company to boot. So, if you have a penchant for quirkiness and an appreciation for the past, present, or future, consider giving Markeroni a try. I would be remiss if I didn’t also mention that Linda is currently running an indiegogo campaign to fund the replacement of the ridiculously archaic computers that she uses to run the site, so if funding zany but beneficial projects is in your wheelhouse, you may want to get in on it in the next few days before the campaign expires.